My Thoughts on James Camerons’ Avatar – Is it truly great? Let me get this out of the way, I liked Avatar. It is an event film that genuinely lives up to the heaps of hype that has surrounded it and in many different ways has changed the way we go to movies. It made me feel like a kid again and that is perhaps the greatest compliment I can bestow. The use of 3D has been used almost to an obnoxious amount in the past couple of years and has seemed more of a gimmick. Avatar legitimizes it, however, and makes it not only a welcome addition, but a necessity. I am hard pressed to find a film in recent memory that is so unbelievably creative and immersive. James Cameron has given us an experience that can only be felt in a movie theater and nowhere else – that is perhaps the films greatest gift. It may also, however, be its biggest downfall. Ask anyone who has seen Avatar (shouldn’t be too hard – grossing over $200 million in just two weeks isn’t easy) and they will tell you that, in many ways, it is more of a ride than a film. The world of Pandora that Cameron creates is unmistakably unique and unlike anything anyone has ever seen. Even more impressive is how believable the alien planet is. After leaving the theater I didn’t want to see the movie again, I wanted to visit Pandora again. Every leaf, creature and insect is absolutely painstakingly detailed to the nth degree. In the current state of cinema flooded with sequels, remakes and My Bloody Valentine 3D it is so refreshing to see an entirely original work like Avatar. It has created a world that will be built upon in countless ways in the future with sequels and mythos that I am looking forward to. As amazing as the ride of Avatar is, it has completely befuddled me. The fact that it is a ride is the foundation of the problem. While I left the theater elated and impressed at what I had witnessed, I also thought that I had no desire to own this film on DVD or Blu-Ray. I planned to see it again, to experience it again, but after time passes I was unsure of how often I would want to return to the story. And isn’t that why we go to the movies? For a STORY? While my opinion on films is not based in a large way on how rewatchable they are, this fact opened my eyes to the glaring problems with the film in question. Quite frankly nothing about the story of Avatar is original. All of the comparisons to Dancing with Wolves and even this summer’s District 9 are completely warranted. A great article dissecting the film’s racial themes at io9 goes into this more deeply. These comparisons aren’t the issue however. The lazy dialogue, lack of character development and a sheer goal to just “display stuff” are the problems. 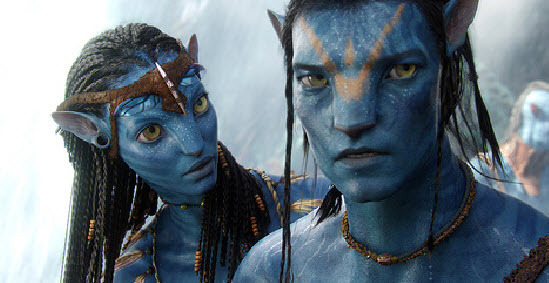 While many large, epic films have laughable dialogue Avatar is different. It is not so much laughable but just downright bad. It has been reported that Cameron had this script written over fifteen years ago. Why the hell wouldn’t you take some time in those FIFTEEN years and do a little editing?! Maybe even more alarming is how bland the characters are. Arguably a story is only as good as its characters – they are whom we empathize with and their journeys are meant to change us and make us feel something substantial. The Navi character of Neytiri (Zoe Saldana) is arguably the only one that accomplishes this basic goal. Her character arc is fully fleshed out and layered with substantial depth. Saldana’s performance is also remarkable and may be another reason why this may change movies – who do we honor with an award, her or the animators? Apart from Neytiri, it is difficult to find another well-rounded character. Our protagonist, Jake Sully (Sam Worthington) is cookie cutter and his predictable emotional transformation is barely given its due. While I won’t give anything away, one fairly major character’s death in the film left me feeling absolutely nothing. A feeling that has been echoed by many, including the guys at the SlashFilmcast. Again, a film that has taken this long to develop and create deserves better basic things – like characters. Most of the articles, news and hype about Avatar has centered around the technology and deservedly so. It is impossible to deny what Cameron has created and things he has done here will be duplicated for many years to come. 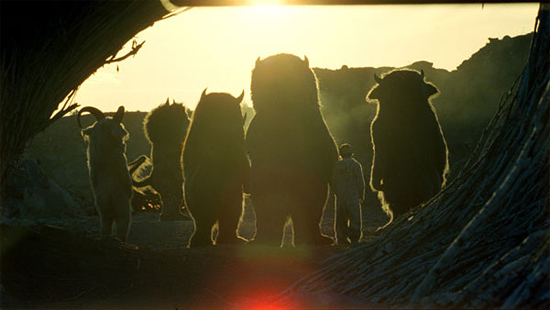 In many ways, however, the film felt simply as a way to show these things off. It was a nearly three hour technology presentation. Was I awe-struck at times? Yes. Did I immediately want to come back and experience it again? Yes. Is it a great film? Sadly, I can’t say that it is. I more than likely would not have been inspired to write this article if it wasn’t for the huge critical praise the film is getting, including some pretty hefty Oscar buzz. These feelings also became much clearer after a second viewing of the film, a necessity for any film trying to be considered “great”. I am constructing my best films of the year list currently and have been speechless at the great amount of films that have been released in the past year. Films that have touched me so deeply and have truly changed the way I think and feel that it will be hard for me to include Avatar on that list. I am still conflicted but can say definitively that while watching Cameron’s epic I saw something great, but I didn’t feel something great.